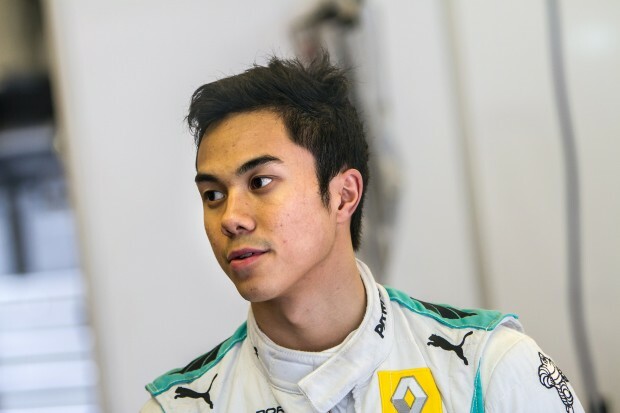 Leading Malaysian international racing driver, Jazeman Jaafar, has recently completed his racing season for 2014 that has focused on a second year of running in the Formula Renault 3.5 Series. Jazeman reflects on the year in this interview. What were the highlights of the year for you? Four moments in time stand out for me – my two podiums, one in Spa and one in Monaco were high points when everything came together for me and showed everyone my abilities. Alongside this, testing the MERCEDES AMG PETRONAS 2012 F1 car was a day to remember. Racing in sports cars at Spa for the first time was another highlight, especially as it was a 24-hour race. Which race is your favourite? I think Monaco is particularly special as it is such an awesome race weekend. We run alongside the F1 Grand Prix, so there are big crowds and you know that the F1 community is there watching. To show them my mastery of a very difficult street circuit is a really good feeling and puts a big grin on my face when I think about it. The whole event from start to finish has a great atmosphere – so many people crammed into the most glamorous town, all watching you perform, and it’s an amazing experience. How would you sum up your second year of the FR3.5 Series? It’s been positive for me. Going into a season with some experience of the car and the racetracks is obviously a good starting point, however I changed teams for this season, racing for the ISR squad. It was a shame I didn’t have a teammate for the season, which was a situation I hadn’t expected to happen. It’s not something I really thought about too much at the beginning, but after a few races I realized the benefits of having two sets of data, a larger engineering base and another driver. I’ve always had a teammate in my racing career and going forward, it’s definitely a major consideration. What do you learn from testing a Formula 1 car? I am very fortunate to have the tie-up with MERCEDES AMG PETRONAS F1 team through my support from PETRONAS and this year I was given the opportunity to drive the 2012 car, previously I had driven the 2011 model. So not only was it another chance to drive an F1 car, I was also able to understand how cars change between seasons as the regulations change and the team evolves the design. I learn a tremendous amount from a test like this, in so many different areas. The F1 set up is so much bigger than I’m used to in Formula Renault 3.5, with a team of highly qualified engineers in F1, rather than just one for FR3.5, a level of working which is tightly structured and highly organized, with the sort of military precision you would expect from a World Championship-winning team. The car itself is not difficult to drive – learning all the buttons on the steering wheel can be more of a challenge! Learning how to get the best out of a car has been an area which F1 testing has been helpful, with the expertise in the team sharing their knowledge with me during the day and through this I’ve been able to improve the handling of the car and bring my lap times down. You had a very successful 24 hours race with HTP Motorsport at Spa, will you do more of these events? I loved my time driving the SLS AMG GT3 sports car with HTP Motorsport; it was an awesome weekend. It’s quite different doing long stints of driving, putting in consistent lap times and being very aware of so many other faster and slower cars around you. Driving in different lights, particularly dusk and night racing is very challenging too. I’d definitely like to do more events like this if I can fit it in with my single-seater racing schedule. What have you been doing since the last race of FR3.5 Series? After the final race of FR3.5 in Jerez there was a series test, so I stayed on in Spain for this, running with a different team to evaluate my options for next year. A couple of weeks ago I did more testing, driving with Fortec and DAMS, which was another chance to look at different teams. I’ll hopefully be doing more testing next month. Not only are these days good to make decisions for the future, but also it keeps me fit for racing and adds to my driving experience. I will also be testing in GP2 next month, out in Abu Dhabi. Nothing has been finalized for next year yet, but as well as a return to FR3.5 Series, the GP2 Series is also under consideration for next season. I will probably have a better idea of my preferred programme, once I’ve finished the 2014 post-season tests, which will be mid-December and then I’ll be in discussions with my sponsors in order to secure my future. One thing is for sure; I’m determined to be in a competitive car, racing for a championship!